- plane trees that is. Masterful wordplay. We laughed until we stopped. Forty London plane trees were planted at T5’s Interchange Plaza, which has been designed to provide passengers with an outdoor haven. Plane trees are renowned for their ability to tolerate pollution, a vital attribute for a tree in one of the world’s busiest airports. If you’re not very good at recognizing our arboreal friends, planes are the ones commonly seen along bus routes, with the splotchy bark and regular growths of missing cat pictures. It took three weeks to lower the 7.5 tonne monsters into the ground. That brings the greenery around T5 up to 700 trees and a million shrubs. But why stick with plane old planes? Let’s make the most of global warming and plant exotic species, to make return trips from the tropics that little bit less depressing. 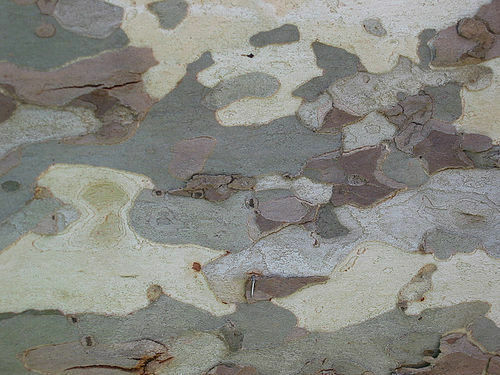 Image of a plane tree’s bark taken from Steve Wilde’s Flickr photostream.